(2011 Rare Pairings Contest) (2011 Jan/Feb Fic Trade) Copper finds an unusual teacher in the woods. Fingers idly toying with the small selection of trinkets balanced in the hollow of her lap, Foxtail considered her surroundings with far more attention than she was giving the task begun long moments ago. She listened to the soft breathing and felt her nose wrinkle as Copper�s scent teased with the faint breeze blowing. She knew the girl-cub stood behind her, slightly off to one side. If she had half the sense and instinct of her parents, she would have hidden herself behind the sturdy log Foxtail noticed when she first chose her spot in the riverside glade. The moonlight was brightest there and she would be better able to compare the effects of her trophies against each other. It was one thing to be stalked, Foxtail thought as she rolled a bead between finger and thumb, and quite another to just be... watched. She set the bead down and chose a small feather that shone blue and black in the silver light. **If you want to see, there�s better ways,** she sent and it was impossible to keep the huff of annoyance or the tickle of amusement from the gentle brush of minds. She heard a soft squeak and bit her lower lip to keep from outright laughing. Copper really was a strange cub - all eyes and no words. Honestly, she did not know what to think of her. Even as she grew, Copper had remained quiet. Between the boisterous Rill and Glow, it was almost too easy for her to slip away and hide. Foxtail frowned slightly as she wracked her brain in an attempt to remember anything specific about the cub. Copper and Cinder seemed to get along but, she thought with pride, it was nearly impossible to not get along with her little brother. With an ease born of familiar motions, Foxtail pinched the end of the small feather in her hand and held it against one of the cut ends of her leather headband, pressing it firm and immobile between the fingers on her hand while her other hand searched out a smaller length of sinew. She still felt the eyes on her and it broke her concentration again. She released her hold with a faint sigh, borderlining on frustration and impatience. Just what was wrong with Copper? 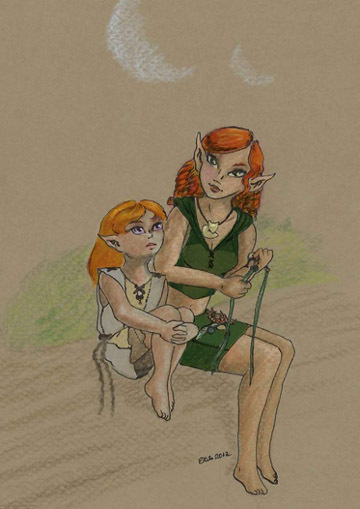 How could she have a mother like Brightwood and still be as skittish and shy as a newborn fawn? Silence could be expected. Look to her sire, Foxtail thought with a flicker of renewed humor. But fear was just as foreign to Farscout as it was to Brightwood, so Ancients only knew. Copper eased herself up onto the log beside Foxtail and rearranged herself with more stability. Her legs dangled but she did not kick her feet like a normal cub might. She merely continued to watch Foxtail�s face for a few moments before turning her attention to the trinkets on the older elf�s lap. Foxtail considered this new development thoughtfully but had enough sense to stop staring at the cub. She brought her attention back to bear on the length of leather in her hands and hid her sideways glances at Copper. Cubs and her, she thought ruefully. Now she understood the faces Beetle made and the laughter over the stories of her own childhood in relation to her friend�s awkwardness. If this cub had been Rill or Cinder or even Glow, Foxtail felt confident that she would know what came next. But this was Copper and Copper hardly spoke, never shouted, gave everything as much thought and attention as Blacksnake or Farscout. You couldn�t just take a cub like that and turn her upside down until she giggled. Come to think of it, had Foxtail ever heard her laugh? She assumed Copper did. All cubs laughed at some point or another. It was a happy time. No responsibilities, no one placing their expectations on you, nothing more urgent than an empty belly or a bored mind. Copper nodded. Then she looked up at Foxtail�s face and her expression changed to something more considering. Finally, she pointed at Foxtail�s fist and then at the remaining trinkets. �What are you doing?� she asked in a careful whisper. Solemn-eyed, Copper bent her head over the offered trinkets and bit at her lower lip slightly as she considered the options. Finally, she pointed to the amber and one of the green-flecked feathers. �Those,� she whispered. �Good choice.� Foxtail�s quick fingers made short work of the task and, before long, the amber and feather were tied securely to the end of the dark green thong beneath the carved bit of wood. The painted clay bead was tied to the other end for a counterbalance. She held it for a moment so Copper could observe and waited for a nod of approval. Then she grinned, stood, and winked at the quiet little girl. Her movements were neat and practiced as she settled the headband in place, pinning her bangs to one side and taming her curls back from her face, tying the knot tightly at the very back, secure against the base of her head. As a finishing touch, her nimble fingers drew the ends around to lay on her shoulders, both dark and bright against the flaming red of her hair and the deep green of her shirt. �What do you think?� she asked with a smirk that let the cub know that only one answer was expected. Sure enough, it came and Copper smiled shyly, nodded again, and offered �pretty� in her soft, little voice. She lifted a hand as if to reach for the trinkets but stopped short almost immediately. She drew back and rested both hands atop the stone in her lap. �Pretty,� she repeated. With a neat flick her her hand, the older redhead moved Copper�s hands away and snatched the smooth stone back. Before (or even if) she could object, Foxtail had caught hold of the loose end of the leather thong tied about her waist and slipped it through the stone�s hole. Copper blinked, staring down at the gesture and then watched in contemplation as Foxtail finished the job - tying the stone firmly to the end of her make-shift belt. Only then did Foxtail sit back on her heels and her grin sparkled with mischief. �Pretty?� she offered helpfully. Copper blinked at the new ornament and then up at the other elf. Her lips parted but no noise escaped. Sighing, Foxtail gave a little shrug. Her smile never quite faded, though, as she pushed back and stood. Absently, she brushed at her knees before going to collect the other trinkets. She slipped them in the pouch at her waist. Well, she'd tried. It wasn�t as if she was cubsitting, she thought. Besides, how was she supposed to know what to do with a cub that hardly said a peep? Hopefully, Copper would follow her back to the Holt proper just as she had followed her out to the quiet log. Foxtail half-turned away at that thought, prepared to take the first steps back with or without Copper, hoping the cub would follow without any begging. She certainly didn�t want to be on the receiving end of a furious Mama Brightwood. Even if she hadn�t invited Copper along in the first place. A small touch brushed her hand and Foxtail froze, looking down with surprise. Brilliant green eyes met glowing lavender and held for a moment until Copper settled her fingers more firmly around Foxtail�s. **Pretty** she sent in a watery, serene sort of color-wash.
You had to laugh, Foxtail thought and so she did, giggling as she squeezed the smaller fingers in her own. **Yes, it is,** she agreed. **Come on. You can show your mother and tell her you won it from... Notch. ** It was hard to restrain the amusement caused by the thought of the tiny elf getting the better of her old friend but it was an irresistible notion. She would have to coach Copper on the proper story to tell. Luckily, they had the entire walk home to practice.